Lina is a fifteen-year-old Lithuanian girl in 1941. She and her family are used to a comfortable life in their beloved country until the political climate begins to change rapidly. Lina's family name is added to a long list of names representing people who are to be arrested and taken without warning from their homes. The inevitable happens. Lina, her mother and brother are separated from her father and forced into captivity. They are herded like animals onto train cars that aren't fit for ANYTHING that lives or breathes. They have no idea where they are being taken or why. 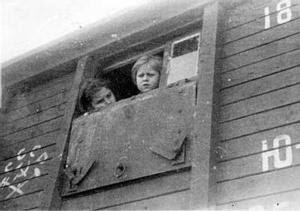 Lina and her family are transported north to work camps where they are forced to endure the most terrorizing living conditions. They are made to perform hard, manual labor for hours on end with nearly no food or water. They are asked to make sacrifices that are hard for the reader to even comprehend. Their strength of character is tested in more ways then seems humanly possible at this point in the story, but it doesn't end there. Eventually Lina and her family are transported even further north into Siberia. They are now 6,500 miles from home and their limits are pushed to the brink. This heart wrenching story beautifully demonstrates just how effective feelings of love, hope, and perseverance can be in the face of the most harrowing adversity. We gave Between Shades of Gray a rating of 4.25 out 5! Brooke was so creative in her approach to this discussion. She came prepared with several "object-style" lessons that helped us to mentally transport ourselves into the setting of the book. She provided us with different ways to experience and understand some of the conditions Lina and her family had to endure. For example, she calculated the "person to space" ratio that Lina and the others had to share in the train car for the first 6 weeks of their journey. She taped off the correct amount of space on the living room floor and asked us all to step inside the space with a few pieces of luggage. We could really get a sense of what it might have been like for those poor captives. It was shocking how tightly we were crammed into the space! She also brought an example of the bread ration that they survived on and an example of what prisoners like Lina might have daringly recorded their stories on. It was such an effective way to make the story come alive. What did we as a group enjoy most about the book? ---We enjoyed the themes of strength, love and hope. What did we not enjoy about this book? ---Most of us didn't not enjoy the ending of the book. We collectively thought the ending was abrupt and left us hanging a bit. What did we think of the main characters? Did we love or loath any characters in particular? Why? ---We loved a few of the characters like Lina, Elena (Lina's mother), Andrius Arvydas. They showed such strength of character throughout the entire story. We were inspired by their courage and resolve. ---The characters that we almost unanimously disliked were Nikolai Kretzsky and Mr. Stalas (the bald man). Although, by the end of the discussion we were able to point out redeeming qualities in both of them. Share a favorite moment or scene from the book. ---We love the scene that was shared between Lina and Andrius as Lina is being deported again. It was one instance where we could see that despite the most desperate situation love could lift the human spirit and give life saving hope. Did we learn something new we didn’t know before we read this book? ---As a group we talked about how we didn't not know anything about the effect WWII had on the people of Lithuania and other surrounding countries in the Baltic region. We learned through the discussion that even to this day this historical tragedy is not openly discussed in the region. There are very few museums or historical documents that tell the story. If it weren't for the stories that were so courageously recorded and the few survivors who are willing to share we still might not know exactly what happened. If one (or more) of the characters made a choice that had moral implications, would you have made the same decision? Why? Why not? ---We discussed at length whether or not we would have signed the confession documents like the "grouchy lady" eventually did. The documents that said that the captives legitimately committed a criminal act and that they understood that we were to be imprisoned for 25 years. We recognized that is almost impossible to know how we would have reacted under those horrible conditions. But most members of the group expressed hope that they would be able to keep their resolve and endure the consequences that came from NOT signing the papers. We also discussed that having small children would be a deal breaker. We were all in agreement that we would do anything we could to protect our children. Overall, what did we think of this book? ---Overall, everyone enjoyed the book and could find parallels between the story and our current lives. We found the story to be haunting and unthinkable at times, but came away with a sense of hope and inspiration from a triumphant story. **THE INTENSE/SCARY SCENES CAN NOT BE COMPARED TO A FICTIONAL HORROR MOVIE. THEY ARE SCARY IN THE SENSE THAT YOU CAN'T IMAGINE ONE HUMAN BEING TREATING ANOTHER HUMAN BEING IN SUCH AN ABHORRENT MANNER. This video explains WHY Ruta decided to write this book, clips from actual survivors and what Ruta hopes this book will do for those who read it. Wonderful review Mindy! You captured the essence of what we discussed and recapped it perfectly.